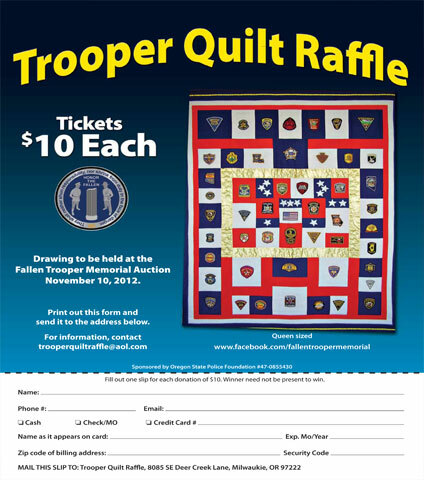 The Trooper Memorial Quilt is a unique and one of a kind item that will make a treasured keepsake for the winner. The idea for this came to me as I was trying to come up with a fundraising idea that would have significance to state troopers. 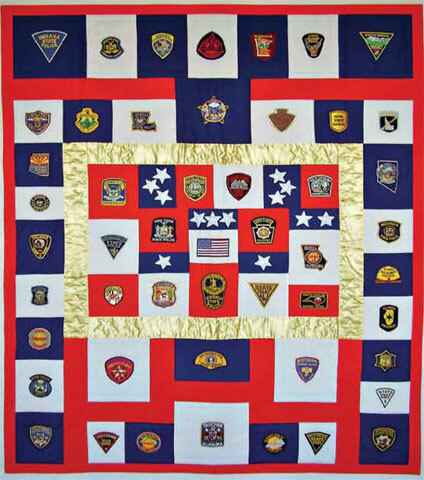 A call went out to all 49 state police and highway patrol honor guard units to provide a uniform patch to be placed on a quilt that will be raffled off as a fundraiser for the Oregon State Police Fallen Trooper Memorial. I specifically asked for a good condition used patch. I wanted each patch to have been worn by a state trooper in the performance of their official duties. In the meantime, I called my mother-in-law to ask if she knew anyone that would be willing to make the quilt. She asked a friend of hers, Julie Kemper, if she was interested. Julie jumped on the idea. She is a veteran quilt maker and was excited to be involved in the project. About 8 weeks later I had received all the patches. Each trooper that sent a patch expressed genuine excitement about the project and wanted to be kept up to date on how to have a chance to win it. I gathered the patches and delivered them to Julie. She conceived the design and placed the patches randomly, except the original 13 colonies which are featured in the center. The quilt was finished in May. Click HERE or The image below to download the form. Making this quilt for the 2012 auction was a very rewarding and challenging project for me. When I was first asked about doing this, I was somewhat nervous, but decided that it was a very worthwhile project for a good cause, so I knew my answer would be an absolute YES! I began quilting in the late 70's and was soon looking forward to the next quilt to be put together. This is totally relaxing, and even more enjoyable when working with friends. Let me describe this quilt. There are 50 state emblems (except for Hawaii, which is represented by the US flag in the center of the quilt). The thirteen original colonies are in the center, with a gold satin border surrounding them. Also enclosed are thirteen white stars, which are represented by the red and white stripes on the flag. The remaining states are encircles around the central rectangle, each on its own block. The color scheme is red, white, and blue, our patriotic colors. We all owe our police men and women our deep respect and total support for all they do to serve and protect all of us, so this is but a small token of appreciation. May God bless them all.